GAH. No fresh sole at the grocery store today. Guess it’s #tilapiatuesday. Perhaps the lamest hashtag ever. Today has been annoying. Distracted by squirrels and shiny objects all day. Not the most productive in the office. Then, one of my favorite belts broke (NO, not because I’m too fat) and my performance at CrossFit was nothing to write home about. Then, the whole lack of fresh sole at the store when I had my heart set on Sole Milanese all day. Should have just gotten veal. Or used the pork in the freezer. WHY did I not just think of that until now… you know, as I’m finishing up the dinner I’m writing about. Ahhhh Tuesday you’ve been mediocre. At least dinner tasted alright. 1) In a skillet, melt the coconut oil over medium-ish heat. 2) Mix the dry ingredients in a shallow dinner plate. 3) Pat the tilapia filet dry with a paper towel, so the egg wash will stick. Combine all sauce ingredients in a saucepan over a burner set on Low heat. Let simmer while you’re preparing the fish. Stir occasionally. 4) Coat the filet in egg, then dredge through the flour/seasoning mixture. 5) Next, pan fry the tilapia. Should be 3-4 minutes per side, depending on the thickness of the filet. 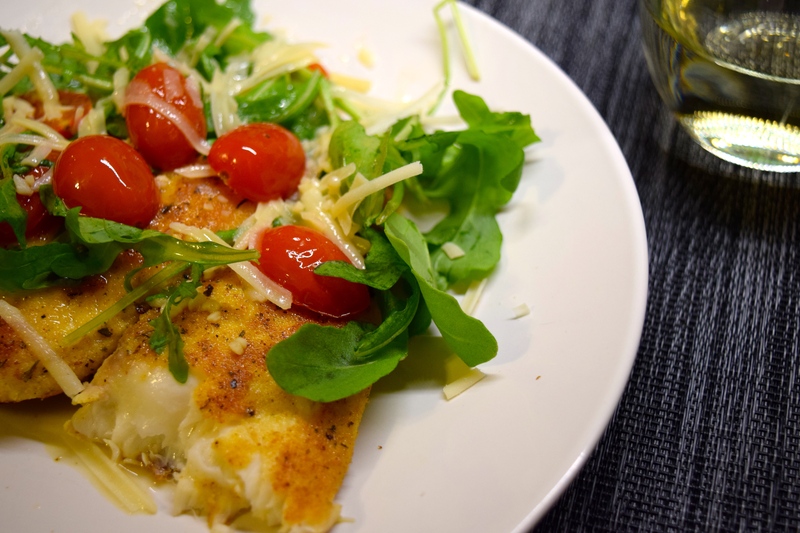 6) Once the fish has been cooked, drizzle the sauce & tomatoes over the filets, topping with as much arugula and cheese shavings as you’d like.